2 posts categorized "Electroqueer Of The Year"
Oh yes EQs - it's a tie this year! 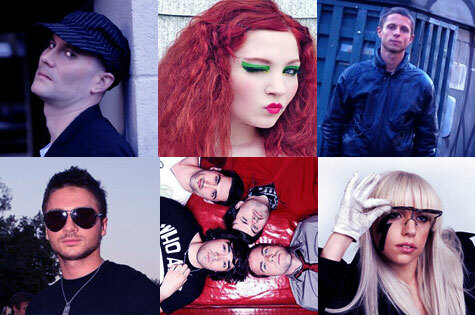 EQ's favourite artists this year were undoubtedly the pop sensations that are Sergey Lazarev and Doe Deere! When choosing this year's recipients for EQ Of The Year Award, these two artists really stood out by a mile, for they represent the true essence of this blog. They are both unique, extremely talented, versatile and create some rather stomping pop music that is a delight for the senses. In coincidence, both artists are of Russian decent as well - and not that well known globally for that matter of fact either - and this made EQ love them even more in 2008. I had the chance to meet both of them this year in London and New York City and they are both lovely people, down-to-earth and everything that they've produced in 2008 just made EQ giddy with excitement. Sergey Lazarev - Although this year didn't see the release of his UK album as promised, what Sergey is doing still really excites me to no description. With a back catalog of pop perfection and UK single "Girlfriend" and Russian electro single "Lazerboy" wowing me beyond belief, we also were treated to the pop pleasure that was "Flyer (Under Fire)" - which didn't win Sergey a place in Eurovision, but it did win over the ears of EQ forever. A talented actor as well, Sergey lives to entertain his fans and lovers of pop music and he works rather extremely hard at it. Meeting Sergey in London for an interview was really a dream come true for me. Seeing him bring his show to Heaven this year was even more exciting. Constantly evolving his sound to sound modern, yet relevant, I don't think we've seen the best from Sergey just yet. His potential to be a world class superstar is endless and I look forward to being a superfan of his for years to come. Read the complete coverage of Sergey Lazarev on EQ. Doe Deere - I first encountered Doe Deere earlier this year when she left simple comment left on the blog saying that she thought EQ would like her music. As curiosity set in, I found that I didn't love her music - I became obsessed over it. Conjuring up an 80's sound with pop hooks and attitude never sounded so fresh in my opinion. Her EP "Supernatural" became the soundtrack to my life for about a month. Whenever PRs or friends asked me who I thought was fresh, I quickly whipped out a "Supernatural" EP from my bag and said "listen to this"... Meeting Doe Deere in New York City was a true delight too - she's the cutest and quirkiest pop star you ever met too (I mean look at her - she's wearing candy canes!). To me, Doe Deere is everything that a pop star should be. Uber brilliant, quirky and interesting, inventive and showing signs of humble versatility in her work are the things that make Doe Deere stand out. Not only did Doe Deere release a must own pop EP in 2008, she also has become a noted beauty and pop culture blogger with the Doe Deere Blogazine and her own line of "so bright it's criminal" make-up called "Lime Crime" that has girls all over America squealing with glittery delight. When are you coming out with a men's line Doe? She's smart. She's building her own community of faithful followers and with that sort of ambition, EQ thinks she going to be around for a long time. Discover why Doe Deere is so damn special here. So there you have it - Sergey Lazarev and Doe Deere join Antigone and Darren Hayes as top artists on the EQ blog. Also a special huge "thank you for the music" hug goes out to Juvelen, Lady Gaga, James Leon and Temposhark for being utterly fantastic and unique musicians this year as well - EQ looks forward to all your new tunes and clever antics in 2009. Every year EQ picks one brilliant electro/pop artist that has defined the spirit and uniqueness of this blog so that they may reign supreme on our pages for a full year. All of our nominees have participated in EQ interview features and have released some great music this year. Sure it's not like winning a grammy, but it's loads of fun really. In the past, EQ has chosen Darren Hayes as the 2006-07 receipient and Antigone as the 2007-08 winner. And this year, the nominees for EQ Of The Year 2008-09 are...drum roll please..
James Leon: He's got tons of drive and each tune he puts out just gets better and better. It's nice to have seen James grow artistically this past year and with brilliant potential being shown in the way of "Never Been Cool", "Club With No Name" and "Purple Heart" under his belt, James is on his way to being a pop force to be reckoned with. Doe Deere: Yeah, EQ obsessed over her for quite awhile and rightly so. Her EP "Supernatural" was pop perfection and Doe Deere quickly won these pages over as a brilliant electro pop artist who I take great joy in covering. No matter how many times I hear "One Touch" it just never ever gets old. Juvelen: I am totally suprised that Juvelen hasn't taken over the world by now. He's got brillant songs and his album "1" is seriously underrated. Providing us with one of the best songs of the year with "Don't Mess" and "Hanna", Juvelen still is one to watch out for. Temposhark: This was Temposhark's year. Everytime I saw them live, it was a total treat. Critics went crazy for their debut album "The Invisible Line" and rightly so - it's one of the best pop/electronica records to be released this year, yet still criminally underrated. The world still hasn't seen Temposhark's full potential yet and EQ looks forward to covering them for many more years to come.